These are some of the things we have received in the mail lately. 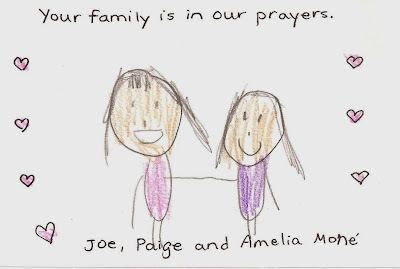 Thank you to Joe, Paige and Amelia! We just love every one of these! The Manski Family paid for a family's meal in a restaurant in honor of Avi. 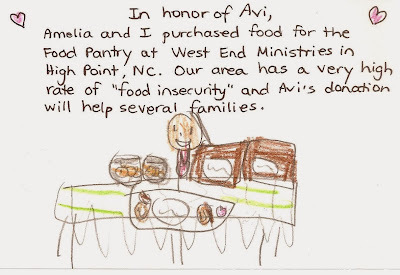 They told the waiter Avi's story so he could tell the family why their meal was paid for. They say they will continue random acts of kindness in honor of Avi. The Quick Family donated money to the Sutter memorial therapy dog program in honor of Avi. The Petty Family donated money to Keeva in order to help a family in Guatemala get clean drinking water. There's more, but this is just for today! I can't even begin to thank my friend Sarah, and these families enough. After losing her child, Elizabeth Edwards said, "if you know someone who has lost a child or lost anybody who's important to them, and you're afraid to mention them because you think you might make them sad by reminding them that they died, they didn't forget they died. You're not reminding them. What you're reminding them of is that you remember that they lived, and that's a great, great, gift." One of my best friends shared this quote with me a few years ago. I absolutely love it! I've felt the weight of her words both the whole time after the accident while Aviana was hurt, and now that she's gone. 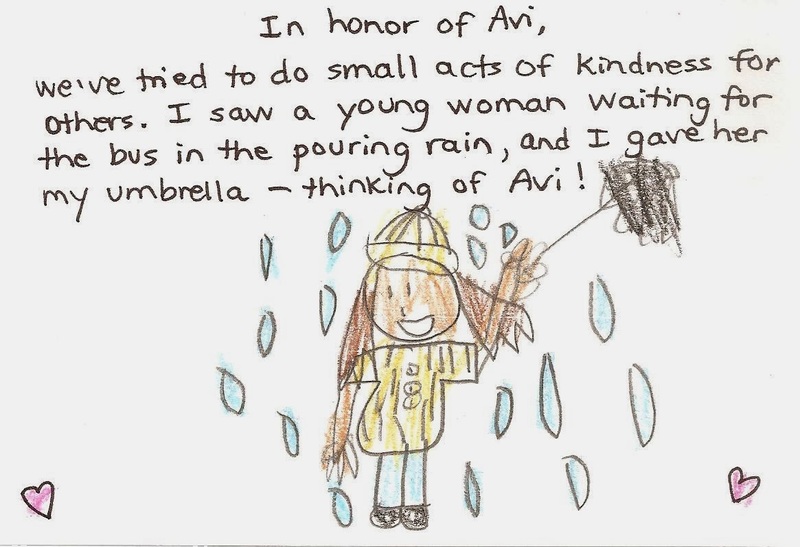 Thank you to everyone who has sent anything letting us know they are thinking of Aviana. You have no idea how much you help in keeping her little spirit alive. Jen, those are beautiful! I hope to come up with something more, but one thing I have done is kept a big gallon zip-lock bag of snacks in my car to hand out to people who hold out signs at stoplights around here. I was thinking about Avi's Elves and how much you have done to help homeless people, so I thought this might be a good start. 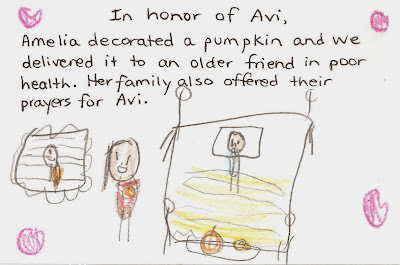 Avi's memory will continue to better the world! I have been down & out with a stomach virus, but I will put serious thought as to how I can honor Avi's memory. What comes to me first off is to be more patient with my children and not get frustrated with them when they can't/won't do something. And I need to smile more.